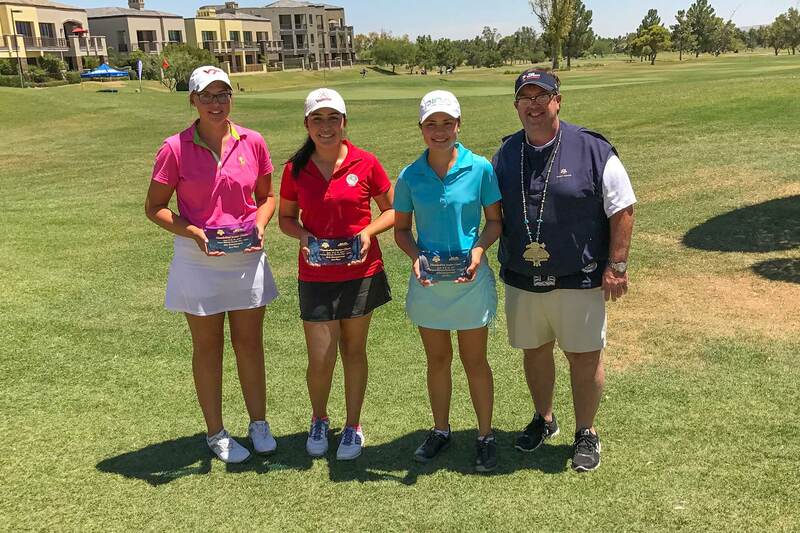 Tucson’s Jonathan Walters and Ashley Menne of Surprise came in first place at the Thunderbird Junior Classic held June 14-15 on Arizona Biltmore Country Club’s Adobe course. With the largest field in the JGAA circuit, the tournament hosted 216 boys and girls in five age divisions. In the Boys Championship Division, Walters’ lone bogey in the two-round tournament came on the first hole. He quickly erased it with a birdie on the next hole before finishing with a tournament-low 8-under-par 64 that included two eagles and five birdies. He followed it up with a 65 in the second round to finish at 15-under par (129) for the tournament, two strokes ahead of Daniel Thompson of Phoenix (65-66—131), and five strokes ahead of third place finisher Cameron Barzekoff of Mesa (67-67—134). In the Girls Championship Division, Menne also posted a tournament-low 67 in the second round to finish at 8-under par (69-67—136), six strokes ahead of Emily Mahar (70-72—144) of Phoenix, and eight strokes ahead of Toni St John (72-72—144) of Gilbert and Alyzzah Vakasiuola (71-73—144) of San Tan Valley who finished tied for third place. Noah Nuez of Laveen won the Boys 15-18 Division at 8-under par (70-66—136). Anawin Pikulthong of Gilbert won the Boys 13-14 Division at 6-under par (70-68—138). Tyler Spielman of Cave Creek took top honors in the Boys 11-12 Division at 6-over par (58-56—114), and Alec Hilgers from Litchfield Park won in a playoff in the Boys 10 and Under Division at 5-over par (32-27—59). Brooke Beyer, Mesa, won in the Girls 15-18 Division at 1-over par (74-71—145). Sydney Bryan of Mesa won the Girls 13-14 Division at 3-over par (72-75—147). Annie Dawson of Phoenix won the Girls 11-12 Division at 19-over par (63-64—127), and Natalia Lamadrid won in the Girls 10 and Under Division at 7-over par (28-33—61). Title sponsors of the Thunderbird Junior Classic, The Thunderbirds were founded in 1937 with the mission of promoting the Valley of the Sun through sports. Consisting of 55 “active” members and more than 250 “life” members, The Thunderbirds host the Waste Management Phoenix Open; the best-attended golf tournament in the world, which to date has raised nearly $110 million for Valley charities, including the JGAA. With its unmatched fan participation and rich history dating back more than 80 years, The Waste Management Phoenix Open has gained legendary status for being a unique stop on the PGA TOUR.